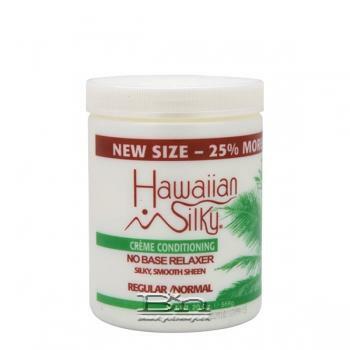 Hawaiian Silky Creme Conditioning No Base Relaxer Silky, Smooth Sheen - Regular Allows for thorough relaxing without the hassle of applying base creme. This formula has protective oils blended with the relaxer creme that coat the scalp and prevent burning and is excellent for medium to coarse hair. Direction: Conduct a stand test 24 hours prior to application, according to directions and proceed only if results are favorable. Do not wet or pre-shampoo hair.